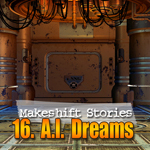 AI Dreams is the third installment in a series of bedtime classics adapted to the Makeshift Stories universe. In this episode, loosely based on the popular folktale of the Ginger Bread Boy, Amos creates an artificial intelligence that escapes taking his secrete research with it. Distraught Amos enlists Raymore to help him, but Raymore has other plans.